People wouldn’t think twice about seeing dogs in yards or cats peering out windows. But what if it was a bear sitting in a fenced-in backyard or a monkey looking out the window? Odds are people would do a double take. Yet, as adopting exotic pets becomes more and more trendy, your chances of seeing strange animal companions are rising. National Geographic recently covered the phenomenon in “Wild Obsession,” an article by Lauren Slater which discusses the growing popularity of exotic pet ownership, the upsides and attendant controversy. According to the magazine, there are more exotic animals living in American homes today than in American zoos and circuses combined. About 66% of exotic pets live in private homes, compared to 26% in zoos and 6% in circuses. While reliable numbers are hard to come by, according to a NBC report, between 2003 and 2006, over 650 million critters were legally imported into the U.S. By one estimate, between 5000-7000 tigers are kept as pets. Animal welfare advocates and wildlife conservationists alike criticize the exotic pet industry, claiming it is cruel and dangerous. Keeping wild animals in captivity only leads to the animals’ suffering, they say. Plus, private ownership has lead to numerous incidents of injury and death. Few can forget when a “domesticated” chimpanzee named Travis mauled a Connecticut woman; the chimp was shot dead on the scene and the woman required a face transplant. Others will recall when, in 2011, a Zaneville, OH, man opened the cages of his exotic pets; the man then committed suicide while local authorities used assault rifles to hunt down dozens of majestic lions, tigers, and bears. Still, many people attest to the contentment and companionship they get from these wild animals, at least some of which are rescued. Some owners satisfy a need to feel powerful while others parent their pets. 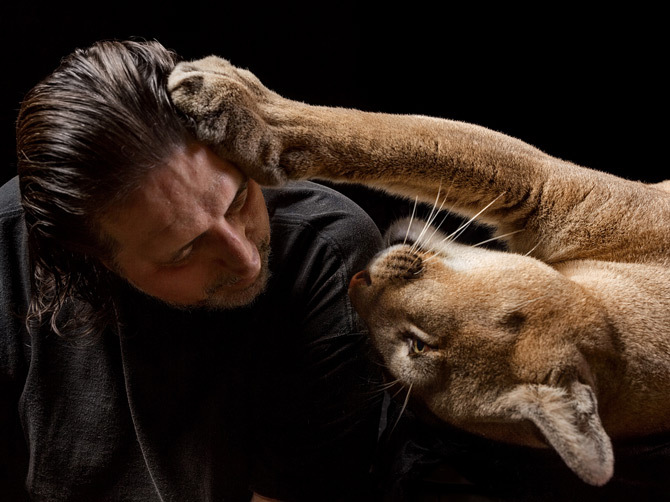 National Geographic created a gallery to show the good, the bad and the ugly of owning wild animals and raise awareness about the exotic pet ownership.